In the year that marks the 50th anniversary of the James Bond film franchise, the world’s first male fragrance dedicated to the legendary British spy is born: James Bond 007. The essence of a true icon, James Bond 007 fragrance is a classic and unmistakably masculine scent with a fresh, sophisticated twist – the ultimate scent for the modern man. The fragrance will launch with an iconic print campaign shot by Greg Williams, the on-set photographer that creates the advertising for the James Bond movies, which includes the highly anticipated next instalment of 007, SKYFALL. A modern interpretation of the Bond silhouette acts as a focal point for a campaign, with an air of intrigue that enables every man to imagine himself in the shoes of this inimitable, contemporary hero. Keith Snelgrove, global business director of James Bond’s production house EON, comments, "It has been an exciting experience coming together and working so closely with P&G to create the debut James Bond fragrance. This is a special year for 007, and we are thrilled to launch this distinctive and sophisticated scent during Bond’s 50th anniversary year." For half a century, James Bond has captured the collective imagination of the world with his masculinity, charm, and elegance. He is the quintessential icon with whom men everywhere identify. He is celebrated and renowned across the world; an untouchable fantasy – as revered by men as he is desired by women. He is the ultimate male symbol who flawlessly combines irresistible sophistication with uncompromising masculinity. In James Bond 007 fragrance, these characteristics collide in the most dangerous of ways, and culminate in a robust signature scent which embodies the duality of Bond; an opulent blend of sophistication and masculinity. The James Bond 007 fragrance is a signature scent for the Bond man: a unique fusion of traditionally authentic and unmistakably British ingredients shape a classic fragrance with a modern twist – a must have for the 21st century contemporary man. 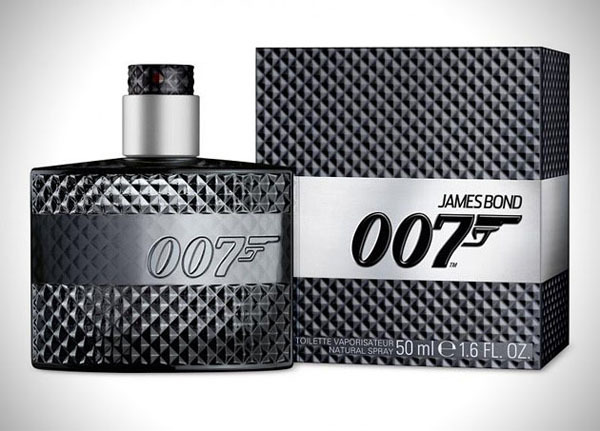 At the time when the first Bond films of the 1960’s revealed the ultimate male icon, the world of men’s fragrance witnessed the dawn of the unofficial “hero” scent signature – the Aromatic Fougere. Only an Aromatic Fougere – the most virile, vibrant and bold of all perfume families – could bring to life the essence of Bond. A backbone of rich, reassuringly elegant lavender with undertones of moss and coumarin create the unapologetically masculine scent that is the James Bond 007 fragrance. Vetyver, a Haitian ingredient brings undeniable power and strength blended with sensuality, captures Bond’s charming and refined characteristics. Crisp apple, the quintessentially British ingredient known for its fresh flavor, reflects the smooth side of Bond, and adds a refreshingly light quality that perfectly harmonises the heady Fougere. Sandalwood offers a full bodied essence which creates the fragrance’s long lasting and powerfully masculine qualities. The exclusive and distinctive bottle references the most iconic elements of the Bond world: the sleek glass flacon in dark blue takes inspiration from the magnum meshing texture found on an array of Bond’s slick automobiles; the silver ‘twist’ cap which reveals the fragrance nozzle is a nod to Bond’s indispensable, state-of-the-art gadgets. The 007 logo, a global emblem for dangerous sophistication, is subtly embossed on the front of the flacon to keep with the sleek, timeless design. Available at Kohl’s and kohls.com. Candies Introduces First Ever Beauty Collection!